Apple HomePod review | What Hi-Fi? That Apple does things in its own sweet time is no new discovery. But even by its own standards, the company arrived late to the wireless speaker party. But being late is perfectly acceptable if you’re the life and soul when you arrive – and that’s pretty much the story with the HomePod. Despite some flaws and limitations, the HomePod is the best-sounding smart speaker available - and by quite a margin. When combined with Siri’s reinvention as your personal DJ/musical guru, it makes for an endlessly entertaining all-in-one system. Assuming you’re already deep in the Apple ecosystem, that is. It comes as no surprise the HomePod is beautifully made and looks classy. It’s a bit smaller, and much heavier, than you might imagine – dense in the manner of dark matter. It’s also a subtly styled device, particularly in the Space Grey finish of our review sample. This is a speaker that, between its cylindrical shape and seamless mesh fabric cover, is designed to blend into, rather than dominate, its surroundings. Not that it’s without neat touches. That glossy top panel, uniformly black when the speaker is resting, is where Siri appears as a shifting ball of colour. The way it floats within the blackness of the panel is undeniably cool. When playing music, '+' and '-' symbols appear, giving you touch-points to raise or lower the volume. Tapping the centre of the surface will play/pause, skip track or go back to the previous track, while keeping your finger pressed summons Siri. But the really impressive stuff is hidden beneath that acoustically transparent mesh. Having started with an entirely clean slate and apparently worked on concepts for years (HomePod development began in 2012), Apple eventually settled on having the tweeters at the bottom and the woofer at the top – the exact opposite of the arrangement found in most traditional speakers. 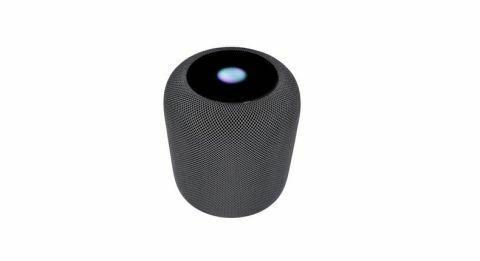 The tweeters fire outwards and are angled slightly upwards, with the intention of not bouncing sound off the surface upon which the HomePod is placed. By avoiding these reflections, Apple can exert greater control over the treble’s behaviour. There are seven tweeters in total, evenly spaced around the base of the unit. The woofer is close to the top and fires upwards, reflecting mid and bass frequencies off the bottom of that glossy panel so they are distributed equally around the device. It’s an energetic driver too, capable of moving a full 20mm from peak-to-peak, which is extraordinary excursion for a compact driver in a dinky wireless speaker. Embedded in the underside of the top panel, shielded from the bassy battering it receives from the woofer below, is Apple’s A8 chip. This is the same chip that first appeared inside the iPhone 6 and 6 Plus back in 2014. That might make it sound rather old, but for a wireless speaker it’s quite the powerhouse. So, what’s all of that processing power used for? There’s Siri, of course - but, perhaps more interestingly, it analyses the speaker’s surroundings and the music being played to ensure you always hear the HomePod at its best. The surroundings are only analysed when you use the HomePod for the first time or move it to a new position (there are accelerometers to let it know) and, unlike the implementation of something like Sonos, involves no manual measuring on the part of the user. Instead, the HomePod uses the first song you play to listen to itself and adjust the sound accordingly. If it’s in free space, sound will be dispersed equally around the speaker, but if it’s close to a back wall the HomePod will actively split out some of the more ambient elements of your music and bounce them off the rear surface while projecting the vocals and more direct sounds straight into the room. It’s clever stuff. Wherever you place the speaker, it is constantly analysing the music you play and dynamically tuning the sound, from bass to treble, to deliver the track as intended. Or, at least, as the HomePod thinks it’s intended. But it seems the HomePod has a good grasp of the intentions of a track. At no point in our test do we play a single track that sounds anything other than absolutely correct. That’s not to say we’re talking about a perfect delivery, but the HomePod is great at honing in on and delivering the essence of everything you play through it, from Bach to Band of Horses, Bonobo to Bob Marley, The Notorious B.I.G. to Bullet for My Valentine. Play Join the Dots by Roots Manuva and Charli 2na and you can revel in bass that’s superbly deep for a little speaker. It is also tuneful, energetic and punchy, putting to rest any fears the HomePod might be a little too Beats-like. Instead, this is an expressive bottom end - which is essential to getting the most out of the deep brass and deep vocal on the track. At the other end of the frequency range, the expertly judged treble delivers the snap and detail of the high hat without ever sounding bright or aggressive. Even a track featuring Charli 2na has lots of mid-range action, and the HomePod does a good job of projecting the vocals and horns. At the most congested points, the HomePod becomes just a little muddled and some rivals (such as the Ultimate Ears Megablast) offer a little more clarity in their organisation. But for scale, authority, drive and excitement, the Apple speaker is just superb. The HomePod can turn its hand to anything, and is just as happy playing The Road by Nick Cave and Warren Ellis (“happy” is the wrong word for this collection, but you get the drift). The centralised, simple, solo piano notes at the start of the title track lack the nuance of true, traditional hi-fi - but there’s more texture here than you would expect from a small, all-in-one speaker. It does a superb job of upping the ante as each mournful component is added on the way to the tear-jerking crescendo. What's more, you don’t need to pump up the volume in order to get the HomePod singing. Even at low volumes the core excitement is retained, with more bass weight and punch than rivals can muster when similarly quiet. And it’s also capable of going loud, and remains composed, clear and unflustered even at maximum volume. Apple’s promise of 360-degree sound is, unlike many similar promises made by other brands in the past, also pretty darn accurate. With the HomePod standing in free space, the sound you hear is very consistent regardless of where you are in relation to it. There’s not enough in it for you to be upset should you not have a wall to place the HomePod next to, though. If you’re an Android fan and have made it this far into the review, well done. But the bad news is the HomePod is not for you. Not only does it not have Bluetooth, you can’t even set one up without an iOS device. On the surface of it that might seem unfair, but we don’t think that anyone who doesn’t already own Apple devices will choose the HomePod as their first. That just wouldn’t make sense. Assuming you are an Apple user (running at least iOS 11.2.5), setting up the HomePod is an absolute delight. Simply hold your iPhone or iPad close to the speaker’s top panel and it will appear on your screen. Select the room that you’re using it in, enable personal requests and tap once more to transfer your iCloud, iTunes and Apple Music settings, and the HomePod is good to go. Interestingly, the HomePod doesn’t have a dedicated app on your iOS device. A small number of settings are available via the Home app (which is where you’ll also find any Apple HomeKit smart home devices) and you can skip back and forth through tracks and adjust volume in the Apple Music app - but this is largely a hands-off, voice-controlled user experience, with all the consequent pros and cons. The big pro is that Siri is surprisingly good here. Apple has clearly tailored Siri for music over the last year or so, and in concert with Apple Music’s superior curation engine it makes for rewarding interactions in a musical context. Say “hey, Siri, play something I’ll like”, and the voice assistant will use its knowledge of your music tastes to select something that you may enjoy, rather than something you already listen to. But if that’s not what you’re in the mood for, say “play something different” and Siri will choose something from a different genre or era. The result is you’re regularly surprised and delighted by Siri’s choices, as you would be a friend who knows what you may like. This really elevates the HomePod experience over that offered by Alexa and Google. Siri understands context better than rivals, too, so if, for example, you say “play Alison” and get the Elvis Costello track when you wanted Slowdive, following up with “play the other one” will get you to the track you were after. There’s also nuance to Siri’s knowledge, opening up slightly more complex requests. It understands “post-punk music for a party”, for instance, or “romantic music from the 70s”. Combined with the many different ways you can issue an instruction or ask a question, these things make for natural and useful interactions with Siri. It’s also worth noting the HomePod does a genuinely impressive job of hearing your instructions over the loudest music – even when you can barely hear your own voice. The almost complete reliance on Siri does have its drawbacks, though. For example, adding a track to your current queue is something that can only be done using your voice, which means constantly interrupting what you’re already playing. And there are, of course, occasional stutters and misunderstandings which, even after a long sequence of positive interactions, can shatter the illusion. Overall, though, we’ve been pleasantly surprised by the overall efficacy of Siri, particularly having been largely unimpressed by it in iPhones and iPads over the last couple of years. It seems Apple's tailoring of its voice assistant to music has made it a more solid and useful performer in the context of a wireless speaker. Siri will do more than control your music - you can control your lights or heating, read out and reply to messages, find cinema tickets, read news headlines and all sorts of other tricks. But the focus is music, and we’re all for that. What we’re not so keen on is Apple’s walled garden. There are elements that are unsurprising, such as the fact that Apple Music is the only streaming service that Siri can control (as well as podcasts and anything you’ve stored in your iCloud Music Library), but there are some that seem overly controlling, even by Apple's martial standards. The only live radio station that will stream from the cloud, for example, is Beats 1. Sure, you can send audio from the likes of TuneIn or BBC iPlayer (or Spotify, Tidal or any other audio app for that matter) using AirPlay on your iPhone or iPad, but doing so runs down your portable’s battery and involves a decrease in sound quality. We’d love to say AirPlay 2, available now via the iOS 11.4 software update, has brought with it the ability to use your iOS device as a controller to direct the HomePod to stream content straight from the internet - which is how Sonos has always worked - but, alas, that’s not the case. But AirPlay 2 has brought with it the ability to combine two HomePods in a stereo pair, and should you have the appetite and capital for such a setup, the performance is even better than perhaps expected. You of course get a far wider soundstage, with traditional left and right separation, but there’s also excellent panning across the front and impressive central focus for the musical elements that require it - the vocals, for example. But what’s most impressive is how two paired HomePods continue to use their processing smarts to bounce the more ambient sounds of a track off the wall behind, and the extra spaciousness and three-dimensionality that this lends to the music. This is a big, open, atmospheric performance - much more so than rival pairs of wireless speakers can manage - and two HomePods working in concert also sound predictably weighty and solid. The only slight flaw is that the sound isn’t projected into the room quite as effectively as that of some rivals or, in fact, a pair of traditional hi-fi speakers. In the average room it won’t be an issue, but if you sit a long way from the two HomePods you will notice that the lovely spaciousness has come at the cost of a little directness. The update to AirPlay 2 has also, finally, brought with it support for multi-room. This works exactly as expected - add each HomePod (or supported speakers from other brands such as Sonos, Naim and B&O) to a specific room and, via Siri commands, you can play the same music everywhere or different tracks in different rooms. We’ve had no issues with synchronisation across speakers during testing. It is worth noting, though, that the complete lack of sleep timers, and the inability to set alarms that wake you up with anything but Apple’s own chimes, make the HomePod a less-than perfect bedroom speaker in its own right. At least in its current form. The HomePod still isn't perfect, but the addition of multi-room support and, to a slightly lesser extent, stereo pairing has closed two of the biggest gaps in its feature set. A recent discount of £40, taking the price to £279, sweetens the deal a good bit, too. You still need to be a dedicated Apple user to even consider the HomePod, and Apple Music needs to be your default streaming service for you to get anything like the best out of it. If that sounds like you, the HomePod is the party-rocking, musical horizon-broadening smart speaker you’ve been waiting for.